The following educational opportunities are available to all trainees on the unit to supplement your own self-directed study. We have a state of the art 3G high fidelity simulator suite in the ICCU. 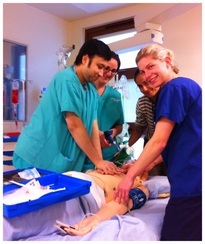 Simulation teaching takes place regularly to allow all trainees at least one simulator session during their attachment. ​This is a free multidisciplinary course run by the critical care education team designed to improve the knowledge, skills, team working and confidence in the event you are faced with an airway emergency in critical care at Sunderland Royal Hospital. ​Trainees on the ICCU on call rota will be allocated and expected to attend a CCAE course during their ICCU placement. After the daily ward-round we usually have a coffee. During this time, one of the trainees will present a topic over 15 mins using up to 5 power point slides. The Consultants on the unit for the week will co-ordinate 5:15 teaching, allocate trainees and may suggest topics. The daily 5:15 teaching sessions allow trainees to identify their learning needs, undertake self directed learning and discuss a topic with a consultant. 5:15 is also a useful tool to allow trainees to gain confidence presenting to the multidisciplinary team. If you have a quiet 10-15 minutes during the day, these tutorials are available. Any of the Consultants will sit down and go through one with you. To access them click here. In 3-6 months you're not going to be able to conduct a research project, but you are more than welcome to join our research activity (consent, screening, interventions etc.). If interested, it would be worth ensuring you have up to date GCP training in place, and contacting Dr Roy, (our research lead) before you start. The blog highlights topics of interest or recent papers to be aware of. Anyone can write a post - if interested speak to Pete Hersey. To join in the discussion, simply leave a comment after a post. No comment is a stupid one, and the more people take part the better it works. On the last Friday of every month we have an ICCU MDT meeting incorporating M&M and various other presentations from 9 until about 11. This is followed by an hour of consultant delivered trainee teaching. We have adjusted the rotas to ensure as many trainees as possible are available, and you should make every effort to attend. One of the Consultants on ICCU will hold the duty bleep to ensure teaching is uninterrupted. On the final Friday of the month following the ICCU MDT meeting one of the ICCU Consultants will deliver an hour of teaching. All trainees are welcome. Every Trainee on the unit has the opportunity to undertake an audit or quality improvement project; whether you do or not will depend on your motivation and the amount of time you have available. Please speak to you ES or the audit lead. Please note you must submit a trust audit registration form prior to data collection. They can be found via this link on the trust home page. We are fully supportive of allowing leave to attend the regional critical care training days. A calendar of when these days are and where they will be held is available here. Follow up clinics are held approximately once a month on the ICCU in the interview rooms near reception. The clinic dates are in a diary managed by the anaesthetic secretaries. If you would like to attend a clinic please call or email the anaesthetic secretaries who will put your name down. Through structured conversations, coaching can be useful to allow you to work on your strengths and meet challenges. For details click here.